What is the Buffalo Niagara International Airport’s Corporate Parker Program? The Buffalo Niagara International Airport’s Corporate Parker Program is a fully automated rewards program. Park on-site at the airport for your business (and leisure trips) and receive discounted rates based on annual corporate expenditures plus priority entry and exit lanes that minimize your wait time. With Frequent Parker Rewards Points which allows each individual enrolled in the program through their company to accrue user points that can be redeemed for FREE parking and other exciting rewards. Without Frequent Parker Rewards Points This program is available to companies that choose to receive a further discounted parking rate in lieu of receiving rewards points. Please see your company’s Travel Manager to find out in which program your company has chosen to participate. See charts below for details on airport parking rates with and without rewards points. 440-735-9280), between the hours of 8:00am – 5:00pm EST, Monday – Friday. What is the basis for the Buffalo Niagara International Airport’s Corporate Parker Program? Convenience – fast and easy automated pass entry to, and exit from, the most convenient parking serving the Buffalo Niagara International Airport. Accessibility – easy online account set-up and management, detailed receipts sent via e-mail upon exit, and activity records and displays past receipts available in your secure, online account. Great Rates – based on your company’s total annual expenditure and the parking lot(s) selected for the employees. 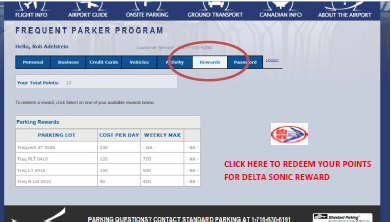 Rewards Points – Points accrue for parking dollars spent that can be easily redeemed online for FREE parking and Delta Sonic Auto Care Rewards. What is the difference between the Buffalo Niagara International Airport’s Corporate Parker Program and Frequent Parker Program? The Corporate Parker Program is reserved for companies to enroll their employees. Their parking rate is based on the total annual expenditure of the Company. There are two options to this program: With and Without Frequent Rewards Points. The Frequent Parker Program is open to any individual that parks at the Buffalo Niagara International Airport on a regular basis. It offers the benefit of rewards points that can be used towards free parking or other valuable rewards. For more information on the Frequent Parker Program, click on here. What is the Corporate Parking Program’s rate structure WITH and WITHOUT Frequent Parker Rewards Points? Parking rates do not include tax. *The Annual Corporate Parking Expenditure applies to the total spent by the company not an individual employee. NOTE: Weekly maximum rate will not exceed published rates. This pricing cannot be combined with any other offer or discount coupon. If your company has chosen to participate in the Corporate Parker Program without receiving the reward points, reward redemptions do not apply to your account. How does a Company determine what parking rates to use for their employees? Each company pre-determines what their anticipated parking expenditure will be at the Buffalo Niagara International Airport on an annual basis. Once this is decided by them, those are the rates they are to use for the various parking lots. An assessment is done by Standard Parking on a quarterly basis to determine if a company is within the spending range to which they agreed. The company will then be given an update by Standard Parking so they are aware of their total expenditure to date. How do I know if my company has a corporate account? Please speak with the travel manager in your office or send an e-mail to corporateparking@parking.buffaloairport.com. How can my company qualify to participate in the Corporate Parker Program? Is there an employee minimum/maximum to qualify? Qualified companies are based on annual parking expenditures. An interested company may send an e-mail to corporateparking@parking.buffaloairport.com. There is no minimum or maximum number of employees needed to qualify. Do all employees within a company have to sign-up for the program? All employees of a qualified company are eligible to join the program; however, it is at the discretion of the company as to which they choose to register in the program. All employees need not participate. Also, the parking rates that a company pays will be based on the total annual corporate expenditure agreed to by the company not individual employees. What if our Company had a corporate account prior to the new Corporate Parker Program? Members of the “old” Corporate Parker Program: effective October 2014, the maximum daily garage rate is $18/day. Effective January 1, 2015 all participating companies in the Corporate Parker Program are evaluated and placed into the tier program based on the parking expenditure from July 1, 2014 – December 31, 2014. Additionally, members of the “old” Corporate Parker Program will no longer receive a monthly statement. Instead, individual members must enroll with a new, secure, online account and assign their credit card for automatic billing when parking at the Buffalo Niagara International Airport. Is this the same as the Buffalo Niagara International Airport Frequent Parker Automated Pass Program with Express Pass? Yes, the former Express Pass Program is the same as the New Automated Frequent Parker Program with a new name. All of the functionality of the Frequent Parker Program applies to the Corporate Parker Program. However, under the Corporate Parker Program, participants also receive a discounted parking rate. How does a Company sign-up to participate in the Corporate Parker Program? You must first contact us at corporateparking@parking.buffaloairport.com. Once your company registers you will receive a sign-up link to enroll online and you will be mailed a free Buffalo Niagara International Airport Automated Corporate Parker Program Automated Pass. The automated pass should arrive in 5 to 7 days after enrollment. Each employee must register him/herself on the secure website. Must all employees from a single company park in the same parking lot? No. It is at the discretion of the employer to determine in which lot each of their employees should park – Daily/Hourly Garage; Preferred Parking Lot; Long Term Parking Lot or Economy Parking Lot. The company will forward a list indicating in which lot each employee is designated to park. Based on that information, when the employee receives his/her automated pass, it will be programmed to allow entry only into the lot specified by the Company. Parking rates will be billed accordingly. I already have an Automated Pass. Will I receive a new pass? You do not need a new pass unless your current pass is not working. A link to transition your current account will be sent so that all of the pass information can be updated and transferred into the new online account. If you have questions, please call 877-735-9280 or visit the Corporate Parking section of our website. Can members of my company use my points? No. With the Buffalo Niagara International Airport’s Corporate Parker Program Automated Passes and points associated with each account are non-transferable and are for each member’s individual sole use. Can our company have one credit card on file for numerous individuals? Yes. Sign up for your corporate account with your individual information. You will have a separate account, username and password although the credit card may be the same as others in your company. Although it is considered a single account for billing purposes each employee will have his/her own account to monitor. Is there a charge to join the Corporate Parker Program? No, membership is free and there is no charge for the initial automated pass. However, if your pass is lost there is a $40 replacement fee. This fee will be assessed to your credit card on file. A replacement pass will then be mailed to you. How does the Corporate Parker Program work? Members are sent an electronic Automated Pass, which is securely linked to your credit card. Simply enter and exit through one of the designated Priority Entry/Exit lanes that have an automated reader. NOTE: Only selected entrance/exit lanes have automated readers. Please look for the reader to the upper left of the gate. They are white and approximately 1ft x 1ft. Do NOT pull a ticket upon entering the parking lot of your choice. The automated pass should be mounted inside your car to the upper left portion of your windshield. The automated system will calculate your time of entry and departure. The credit card on file will be charged for the length of your parking stay. For Companies participating in the “WITH FREQUENT PARKER PROGRAM POINTS” option*, your Automated Corporate Parker Program account will be credited with points from your stay. Members are awarded 1 point per dollar spent on parking in any of the Buffalo Niagara International Airport parking lots or garage. When you are ready to redeem for FREE parking, simply login to your Corporate Parker Program account and select the day(s) and lot or garage for which you would like to redeem. *If your Company has chosen to participate in the Corporate Parker Program without “Frequent Parker Program Points”, reward offers do not apply. First, login to your Buffalo Niagara International Airport Automated Corporate Parker Program account and select “Rewards”. Next, indicate if you plan to park in the Daily/Hourly Garage or in one of the other lots. Kindly identify your selected lot by name. Then, follow the step-by-step guide to redeem points to cover your length of stay. Note that the system will only allow your reservation in the garage/lot based on the number of points accrued to date. If you park for more days than you have points, the balance will be charged to your account. You will receive points for the cash portion of this transaction. Upon arriving at the airport, simply enter and exit the designated lot or garage as usual with your Automated Pass in order to have the points credit applied to your account. Your credit card will not be charged for the days you have redeemed for free parking. There are no certificates to present. The transaction will be handled through the automated system. NOTE: You must enter the parking lot you chose and entered online, on the day that you decided to redeem points or the system will not recognize your redemption. If you return later than the date selected the system will automatically charge the credit card on file for the difference. Corporate Parker Program Rewards points will not be earned on days when free parking redemptions are used. Points are only earned on days of paid parking. Free parking redemption does not reserve a space in any of the airport’s on-site parking lots. If you arrive and your chosen lot is full, you must park in an alternate lot and full payment will still be required. In this case, please contact the Buffalo Niagara International Airport Automated Corporate Parker Program Administration office to have the points you planned to use for this stay returned to your account for use at a future date. You will also receive additional points for the cash expended in the “alternate lot”. The CORPORATE PARKER PROGRAM administration office can be reached at 1-877-735-9280 (outside the U.S. dial 1-440-735-9280), between the hours of 8:00 am – 5:00 pm EST, Monday – Friday, or e-mail info@parkbuffaloairport.com. The Corporate Parker Program Administration office will then receive a confirmation of your order, verify that there are enough points in your account, and if so, deduct the appropriate amount of points from your online account and fulfill your order as requested by mailing the rewards certificate(s) via US mail to the address you entered in the system. NOTE: Please be sure to login to your account to verify your point balance before redeeming for Delta Sonic Auto Care Rewards. If you redeem for an item(s) that you do not have enough points for, the Frequent Parker Program Administration office will contact you to rectify the issue. Can I have a personal Frequent Parker Program account and a separate Corporate Parker Program account? Yes. You can sign-up for two separate accounts with different credit cards so long as your username and password for each account is separate. You will not receive the discounted parking rate under your Frequent Parker Program as it only applies to the Corporate Parker Program. What if I am already enrolled in the Frequent Parker Program? If you are already a member of the New Fully Automated Frequent Parker Program, please send an e-mail with your name and intent to be converted into the Corporate Parker Program to corporateparking@parking.buffaloairport.com. I’ve been parking at Buffalo Niagara International Airport for a long time; can I receive credit for those past stays? Unfortunately, no. The Buffalo Niagara International Airport Automated Corporate Parker Program is set up so that points can only be accumulated from the day a member receives their Corporate Parker Program Automated Pass. The points you accrue will be tied specifically to your registered account. No retroactive points will be given. Are rewards points awarded based on the total of the receipt with tax or before tax? Points are awarded based on the total of the receipt AFTER tax. If your company has chosen to participate in the no points program, Rewards do not apply. First, login to your Buffalo Niagara International Airport Corporate Parker Program account and select “Activity”. Highlight Parking Redemption. Click on the Green arrow to the right of the box. Parking redemptions can only be canceled or modified PRIOR to entering the parking facility for your scheduled parking redemption. Once you are parked, you cannot modify the parking redemption (i.e. add additional days). If your parking redemption has not yet occurred and you wish to cancel it, simply select “Cancel” next to the redemption. In order to modify an existing redemption, you must first cancel the redemption and then go back to the Rewards tab to make a new parking redemption. If you have forgotten your username and need it sent to you, simply send an e-mail to info@parkbuffaloairport.com with your request and your name. Please note that the username is upper and lowercase sensitive. This means that whatever case you use when signing in for the program is the case you must use each time you sign-in to your account. Username error – note that usernames are case sensitive. If you are still unsuccessful, e-mail info@parkbuffaloairport.com with your request and first and last name and a representative will e-mail you with the correct username on file. No. The Buffalo Niagara International Airport Automated Corporate Parker Program automated passes are non-transferable and are for each company employee’s sole use. Family members must sign-up individually for their own Frequent Parker Program account. Although a family member cannot use your Corporate Program account, he/she can sign up for their own Frequent Parker Program account and accrue their own Rewards Points. 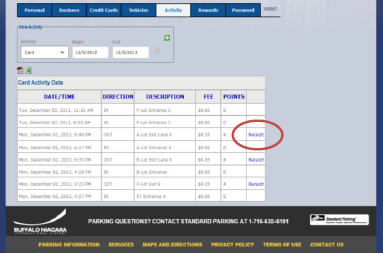 Parking coupons cannot be used in conjunction with the Automated Pass for the Corporate Parker Program or the Frequent Parker Program. 1-440-735-9280) between the hours of 8:00 am – 5:00 pm EST, Monday – Friday or e-mail info@parkbuffaloairport.com to ensure your account is updated with correct information and properly activated. Should your pass not work as you enter the parking lot, you will need to pull a ticket and pay for this parking stay when exiting the lot. To receive points for this transaction you will need to advise the cashier that you are a Corporate Parker Program participant and that your pass did not work. Ask that he/she process the appropriate form for you so your account receives the appropriate number of points for this designated expenditure. What do I do if I lost my Automated Pass? E-mail the Corporate Parker Program at info@parkbuffaloairport.com or call 1-877-735-9280 (outside the U.S. dial 1-440-735-9280) between the hours of 8:00 am – 5:00 pm EST, Monday – Friday, to deactivate your lost pass and order a replacement pass. The replacement pass will incur a $40.00 replacement cost, which will be charged to the credit card linked with the Corporate Parker Program account. Members also have the option to have 400 points deducted from their account, instead of incurring the $40.00 charge. If your credit card has expired, if you want to enter a different credit card or incorrect information was provided, your Automated Pass will not be recognized when you try to enter a parking lot. To update your information such as a credit card, name, address or car make/model, please visit https://fpp.parkbuffaloairport.com/fpp and login to your account. After your information has been updated and you click “Save”, your account information will be changed immediately in the system and your Automated Pass will be reactivated. How can I print a receipt from my Corporate Parker Program account?